Tag Archives for " excercise "
This post originally ran on American Express OPENForum and it seemed like a good Labor Day post. Small business ownership is hard work. Physically demanding, stressful, mind numbing work—and that’s on the good days. But, I wouldn’t trade it for the world. One of benefits of owning a small business is that you are totally free—free to work any 80 hours a week you choose. But no matter how efficient, there’s always more to do than time to do it. For me, one of the secrets to getting more done each day is to pay attention to my physical energy and do everything I can to enhance, store and build it. Spending time engaged in daily exercise is an example of an energy building practice that actually gives me time instead of costing time. In fact, some of what eventually turned into my greatest innovations and ideas presented themselves during an early morning run in the neighborhood. 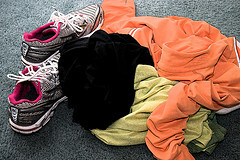 Running: I started running for exercise in high school and it’s one of the most relaxing forms of energy creation for me. Conscious eating: Whatever that might mean to you, it is another energy building practice. Meditation and yoga: These are two powerful forms of stress reduction and energy building. White noise generator: Simply Noise allows me to tune out distractions and gain instant focus. Reading lyrical passages of literature: Passages such as those found in Anam Cara by John O’Donohue is energy and focus building. Creating boundaries by shutting down technology: Doing this occasionally is a good energy building practice. These are just some of the practices I keep in the energy toolbox. Perhaps a lesson on healthy living seems odd on a business site, but it’s very hard to disconnect the physical you from the creative you in your business. I suspect everyone knows they can take better care of the physical plant, particularly as we get older, but I wonder if you’ve considered the role this kind of energy building focus plays in helping you get more done, deliver purpose, maintain focus and bring only the healthiest emotions to the game. Business owners are conditioned to think about assets and liabilities and ignoring your health and energy is one of the greatest ways to move a key asset (you) into the liability column. I know that every single day I get some exercise, I get more done. Mind you, I don’t do it enough, but I can tell you that investing 30 of the 1,440 minutes I have in a day in energy building activities always doubles up and pays off in terms of increased productivity. Go out and get a personal trainer, invest in a chef, create technology boundaries, start learning as much as you can about keeping your body and mind well—it one of the best business investments you can make in your business and your purpose. I’ve written before about exercise as it relates to owning a business. (The Math of Exercise) In fact, if I were to write a general how to book about running a business I would include chapters on health, nutrition and exercise. It’s not that I’m some sort of health nut, it’s just that running a business is a demanding job and, particularly as I get older, one that requires more and more physical and mental stamina. So, in addition to marketing, management and money, you’ve got to maintain the machine that is your body. So, that got me thinking about how and why small business marketers burn out so often when it comes to the act of marketing implementation. What dawned on me is that, to many, it’s a lot like going to the gym. It’s something they know they should do, but it’s also something they don’t always feel like doing. I try to exercise five or six times a week anymore and I know the keys to keeping me motivated are variety and planning. I run, ride, lift, and practice yoga on a somewhat planned, but varied routine. I mix up my runs, for example with speed, hills and long, slow runs. I enter a handful of races to give myself training objectives. And, I plan total shut down days off. Although it’s probably starting to feel like it, this post isn’t so much about sharing my workout routine as it is about equating this proven style of workout to getting marketing done in your business. What if you applied that same mixed, but planned, routine to getting your marketing in shape? What if you set some short terms goals and objectives and then created a cross training approach to meeting them? What if you planned to tackle different kinds of marketing actions on different days? Monday is tweak the web site day, Tuesday is call five past customers day, Wednesday is for writing sales letters, Thursday is your day off, Friday is the day you dive into upping your social network participation and Saturday is the day you take a chunk of time focused only on writing content. This approach would ensure that the right actions are being taken, eliminate some of the stress that comes from knowing you should be doing marketing, and eventually add up to a habitual routine that got your marketing into great condition. This approach would also put a stop to the “sprint or do nothing” mentality that comes about from no plan or system for moving marketing forward. To me, equating growing a business to running a marathon isn’t much of a stretch at all. Anyone that’s trained for a marathon knows that you must have a plan, move forward gradually and consistently and build momentum by mixing up your training to stay motivated. I think that describes a pretty darn effective way to look at building marketing momentum as well. Of course, many athletes know that the advice and accountability that comes with hiring a coach or trainer is the ultimate way to get to the next level!